"My dream has always been to have my own horse, to create this unique bond between horse and rider. It is at 21 years (admittedly a little young!) That I decided to embark on this adventure. 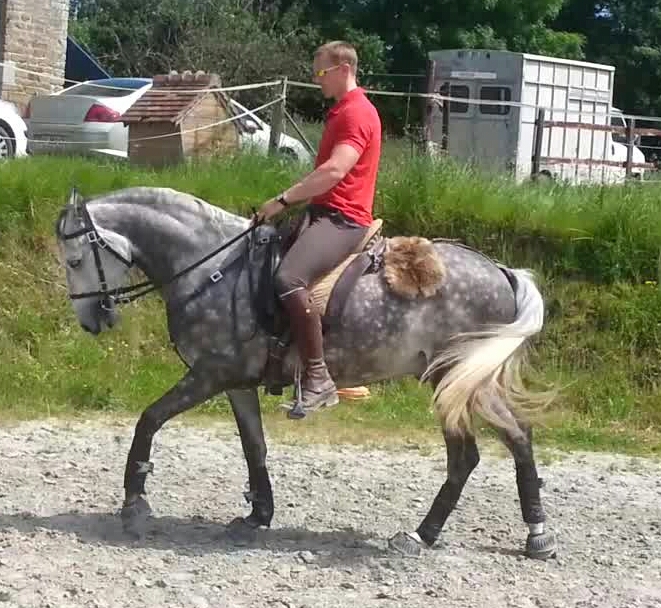 I wanted a versatile horse with which I can take pleasure in taming but also the obstacle. 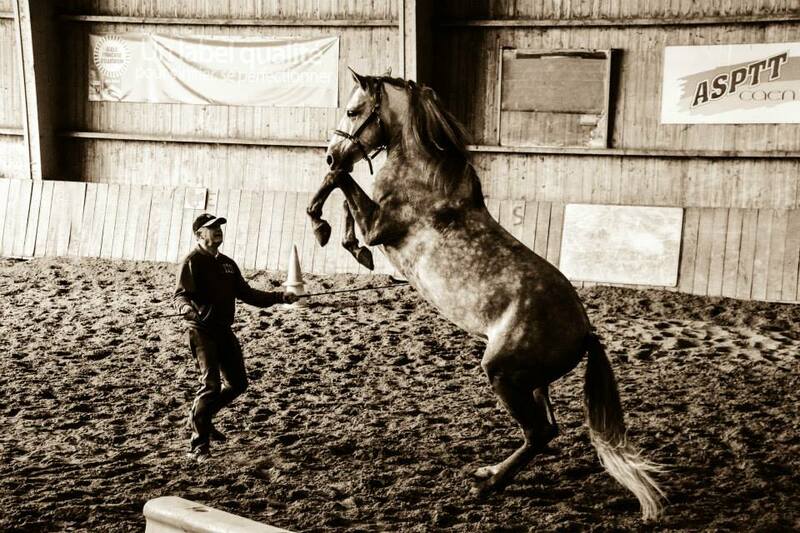 Having your own horse is one thing, but what is more when a Lusitano ... it was unexpected! The Lusitanian horse ideal, the proud bearing and gentle, a dream. And I took the road towards livestock Saint Eloy, arriving 3 hours later, full of excitement and expectation! Titouan Amorin make me a tour of the stables and present different horses I immediately had the heart for Taiga, and she trotted (dare I say) in the head without stopping after a few ... days later, I was cracking up: with the help of Titouan, I have achieved my dream with Taiga. Taiga came early July (2012), and I started stripping with the help of professionals we are now in November, she began to learn the three paces, and began the obstacle with obvious joy, as the following my desires. This mare is a free and voluntary, but she has her own character, her sense of humor to it, I would even say I had some landings, although she seemed to find funny! 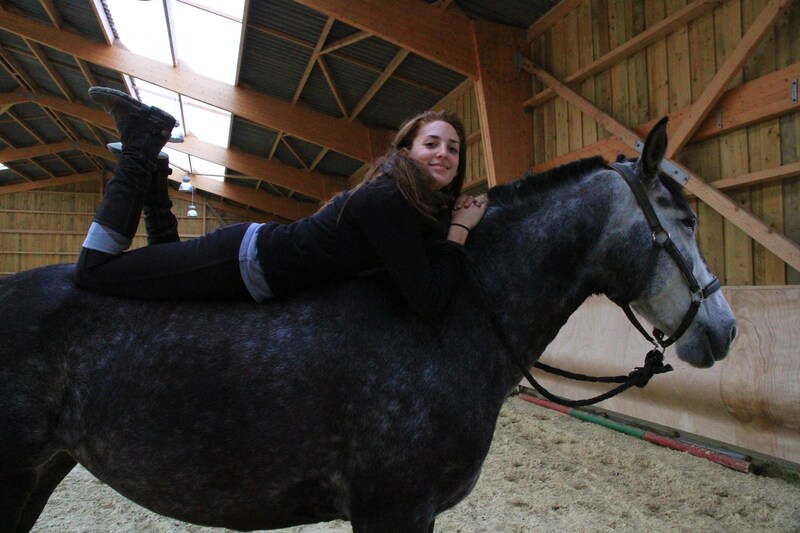 This mare is a very gentle, very affectionate, and I see our relationship grow day by day. A small horse with a big heart, in a nutshell! I thank the entire team of livestock, especially Titouan Amorin, for all his good advice and regular monitoring, I know I can always count on coaching! Solidly educated, low school care for Peter and Vanessa, and having a character of its own Soal is a horse "well placed" as they say but that necessitates to be motivated but once the job is launched to listening and generosity that has characterized the Lusitanians. 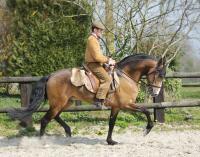 He is currently progressing in dressage and regularly goes out alone or in a group several times a week ... At 6 years old he still has a great potential for growth, he shows a character "well defined" and good intelligence ..... In short a great horse .... 1 for experienced rider anyway. "Valiente has been with us for 2 months. Every day that goes by confirms all the good we thought of him : strong character but never vicious. Valiente's arrival was far from being planned although we have been knowing this stud for 5 years and with whom we have a friendly relationship. In love with Valiente's father for a long time, it didn't take us long to make up our mind for this horse with character. 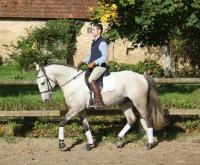 His conformation tends to be more for working riding and shows more than for dressage competition. 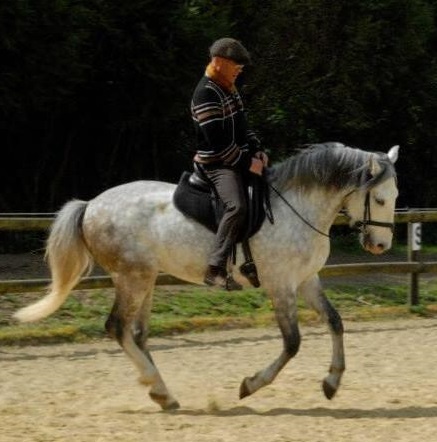 It is such a pleasure to look after, a horse educated with trust, respectful of his rider without being afraid of him. For sure I will advertise the work done as it is praiseworthy. We are only at the beginning of our story but future is full of promises. I think he will fully find its place with us where he will be able to show his paces and his bloodlines. Again a huge thank you to both of you, a special wink at Titouan. Antoine Lanoy"
It is full of hope that I meet Isabelle and Titouan at St Eloy and then : Eureka! Yes, in France, serious breeders do exist; they know how to observe, listen, wait and be patient for the magic to take place. 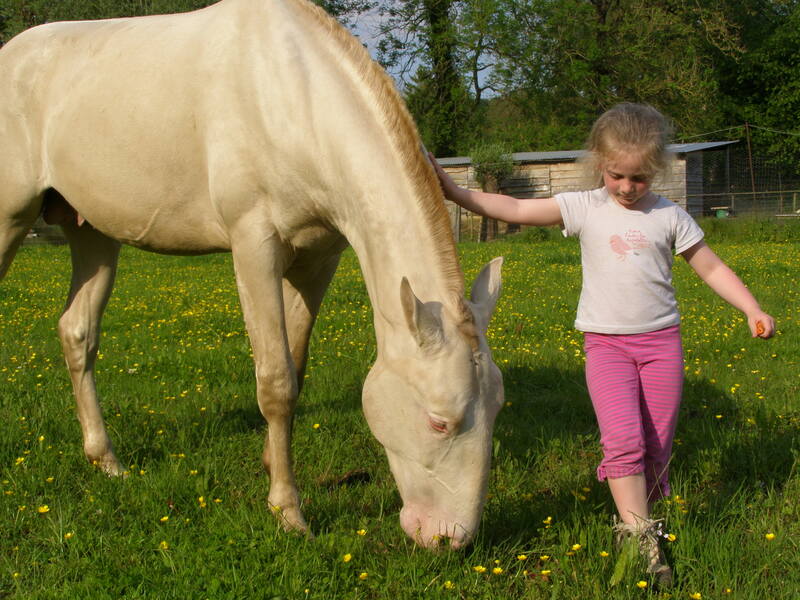 Lovely horses, peaceful, educated, looked after, spoiled and respected in their individuality. I was looking for a ridden horse but it was Mister Corsario d'Escolina who was obvious to me! He simply represents my dream horse! I simply want to warmly thank Isabelle and Titouan for their work quality and their great kindness. You have beautiful and happy horses and you should be proud of all that! Thank you for that lovely meeting. Kindest regards. 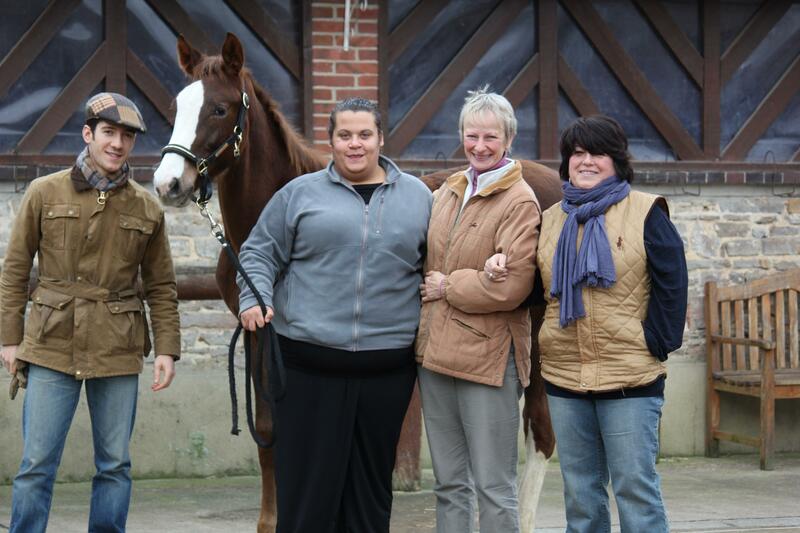 Laure"
" On June, 9th 2013, in Picardie, Frisette, our brood mare died giving birth to a foal called Diablolo Clary. Rapidly the situation became critical and we had to urgently find a brood mare who could take over. The life of Diabolo depended on it. 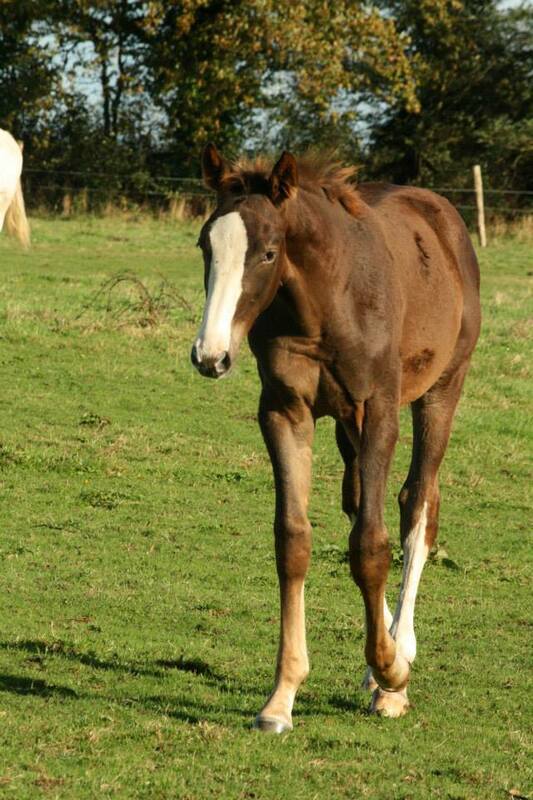 Wethenfound the St Eloy stud who had a brood mare who lost her foal two days before. On the same day, I was off to Normandy with the little orphan where a big adventure began for the St Eloy team. It was no small challenge ! On June,15th, visit to the vet ; he was put on a drip for 24 hours and back to Molay Littry where some more treaments had to be given. On top of broodmare milk, feed bottles were necessary every 3 hours. After 2 weeks, while Mimie took Diabolo out of the stable for care, a so waited neigh happened ! Olaïa was finally a full mother ! I can imagine the joy and the relief of hercircle. What follows is the normal life of a foal amongst his companions. I found a transformed foal and…not ready at all to leave his home ! I don’t know if it is because he was bred by a Lusitanobroodmare but Diabolo has lovelypaces. 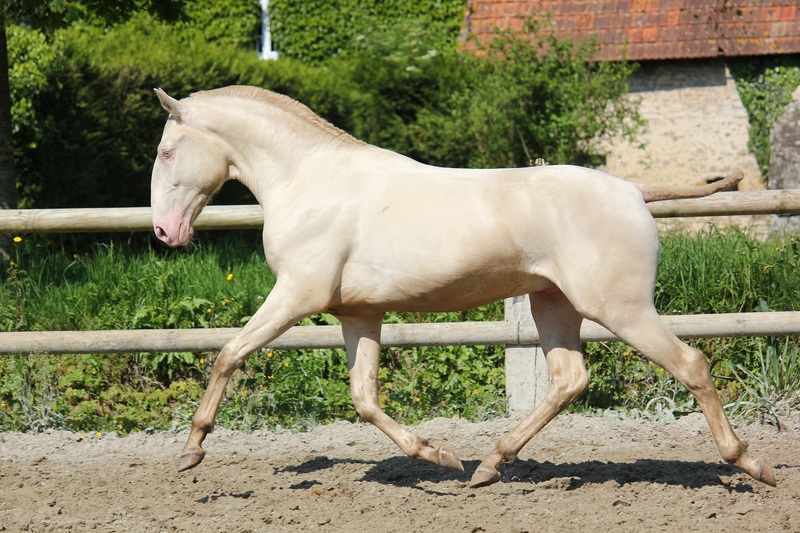 Son of a champion, Diabolo is a Selle Français bred for show jumping. It is difficult to know if he will follow the steps of his eldres but something is sure, whatever his destiny, he will essentially oweit to Titouan and Isabelle Amorin, Anne-Sophie, Vanessa and especially Mimie ( who was so sad the day he left). With their professionalism, their unfailing patience and their trust, they simplyallowed Diabolo to have a future ! May they be here deeply thanked." Chantal Leflamand. Arriving at the stud, I was directly introduced to the employees of the stud. Highly motivated, I made myself available to participate to all the task srelated to mucking out the stables, the distribution of hay, straw and horse feed…I could then participate to several activities around the horses, such as foals and young horses education, lungework, breaking horses observation, riden work and preparation of all the things needed for a competition. Willing to learn, I could find an answer to all my questions while working with people highly communicative of their knowledge. With thosein charge of the general organization of the structure, Charlotte, professional rider or Titouan who supervises many of the activities around the horses. Working with people acting humanly, passionate and full of knowledge, I noticed that the horses are handled with great care since their young age, step by step, and that everything in the organization focus on their well-being. Seeing so many people mobilized to make the life of the horse as pleasant as possible in communion with the human, offer them an intelligent training related to his abilities, I came out totally fulfilled of this training period.